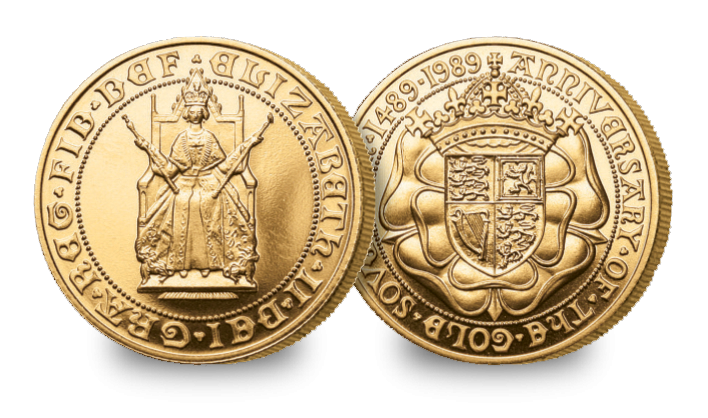 On 28 October 1489 King Henry VII instructed the officers of his Royal Mint to produce ‘new money of gold’.With a value of twenty shillings or one pound the new coin was the largest, both in size and value that had been issued in England and was to be called a sovereign. The obverse showed an enthroned portrait of the King and the reverse featured the royal arms, crowned and superimposed on a magnificent double rose to symbolise the union of York and Lancaster. In 1989 to celebrate the 500th anniversary of the sovereign the Royal Mint issued a special commemorative double-sovereign which featured a new obverse and a new reverse. Both designs were the work of sculptor Bernard Sindall and were based on the original sovereign designs of 1489. The obverse shows an enthroned portrait of Her Majesty Queen Elizabeth II who, like Henry VII on the very first sovereign, is dressed in full coronation regalia. The reverse shows the Royal Arms surmounted on a crowned Tudor Rose.